What exactly is the root of all this antipathy toward Brussels sprouts? Is it the color? Sometimes it's not easy being green. Or yellowish-green. Is it the smell? You know what I'm talking about. Boil Brussels sprouts on your stove top for 10 minutes and the neighbors will begin to wonder which farm animal you recently adopted. Is it your mother's fault? If she served mushy, water-logged, brown Brussels sprouts when you were a kid, it's not your fault that you hate them. Let me attempt to ingratiate Brussels sprouts with you, especially since many of you will likely be cooking and/or eating them next week on Thanksgiving. Though Brussels sprouts have been around since ancient times, they are named after the city of Brussels in Belgium, where they have been cultivated (and appreciated) since Medieval times. Brussels sprouts are members of the brassica family, so they're related to broccoli, cabbage, cauliflower, and kolrabi, none of which are going to win any popularity contests. That's why Brussels sprouts taste like cabbage and are sometimes referred to as "mini cabbages." 1. Select brightly colored Brussels sprouts that are free of black spots or other blemishes, which indicate they are old. 2. Choose smaller Brussels sprouts, which tend to be nuttier in flavor and less "cabbagy" tasting. 3. DO NOT overcook them. Overcooked Brussels sprouts release more sulfur, which causes that smell. You know the one. 4. How you cook Brussels sprouts makes a big difference in how they taste. First par-boil Brussels sprouts and "shock" them. Partially boil the sprouts for 2-3 minutes, then plunge them into a bowl of ice water; this will stop the cooking process and maintain the sprouts' vibrant color. Then you can saute them on the stove top or roast them in the oven. 5. If you are invited to someone's house for Thanksgiving this year, offer to make the Brussels sprouts, so you don't have to suffer Aunt Maude's sadly boiled, mealy sprouts for another year. Everyone will be thankful for that. And for you food bloggers out there, here's a secret for building traffic. Come up with a killer Brussels sprouts recipe. Believe it or not, of all the posts I have written, one that continually elicits reader emails is Brussels Sprouts with Toasted Breadcrumbs and Lemon. Many people have emailed me thank you notes, saying that this "sunny" version of Brussels sprouts has become their new favorite. I even had one woman say she subscribed to my feed because of that recipe. So there you have it, a way to build blog traffic and reader subscribers with Brussels sprouts. I wonder if Problogger knows about this. 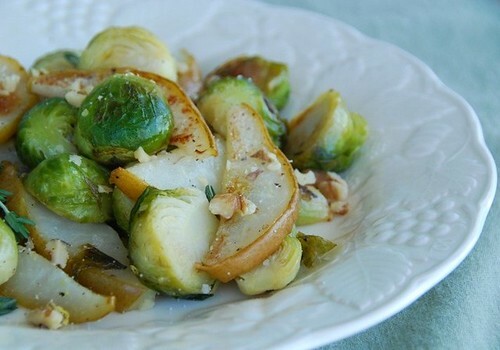 Sweet honey and pears act as a foil to the earthy Brussels sprouts. It's a simple yet elegant dish that is ideal for a holiday dinner. Preheat oven to 400 degrees F. In a large saucepan boil Brussels sprouts for 2 minutes; drain. In a large bowl, combine all ingredients (except walnuts) and toss until vegetables are well coated. Lay vegetables in a single layer on a tin-foil lined baking sheet (for easy clean-up). Roast for 20 minutes, turning once, or until vegetables have a few brown spots. Place cooked vegetables in a serving dish. Drizzle with a little extra virgin olive oil. Sprinkle with toasted walnuts and some extra salt and thyme. Serve immediately. I'm sending this to Siri of Siri's Corner who is the hosting this week's Weekend Herb Blogging. Adding in pears is a wonderful idea!! Thanks for the recipe! Maybe my husband will try brussel sprouts now..ha! We LOVE sprouts in my family... I never understood peoples disdain.. I think it stems from the mushy tasteless stuff that can end up on dinner plates as children. I guess I was lucky to grow up in a house with a mom who was a creative cook! Adding pears... now THAT idea i love... we just had some the other night, or I would make this tonight! Might add this to my Turkey day side dish list. A wonderful post, Susan! Perfect timing too--I just did one on a soup made with roasted cauliflower, another cruciferous vegetable with an image problem. Oh, and thanks for making my Thanksgiving life easier with all your cool sides. Instead of posting a side dish of my own, I just added a link to you in my soup post. Call me lazy, if you like. I prefer to think of it as being efficient. I'm actually working on a post that includes brussel sprouts. These are relatively new in my kitchen, ever since a recipe in Super Natural Cooking turned me on to them! Prior to that I think my mom made me eat them, like, once. She also made me eat pig's feet once. Weird. I'll admit that I'm one of those people who avoids Brussels sprouts because of their sulfurous odor. The only way I ever eat them is barely cooked then marinated in oil and vinegar and lots of red pepper. But I keep seeing recipes like this that make me wish I liked Brussels sprouts. I need to try cooking them myself and see if I can discover their good side. I personally love them but the boy friend hates them so I rarely make them. Love your take on them with the pears, delicious! What a wonderful idea to add pears! I like sprouts as do my family but this takes it to another level - yum. I have to confess I used to be rather brussels sprout apathetic until I tried roasted ones. Love the idea of pears combined with them. I bet it's fantastic! I'm going to post about those little guys today too. I am so impressed that you got such a lovely photo - mine is very washed out. I love the idea of pears in there! I LOVE brussels sprouts (and all those other tasty veggies you listed above!) But I only came to them as an adult because my parents don't eat them. I almost always roast them with olive oil and salt. YUM. I like them sliced in half, lightly sauteed in olive oil with a pinch of coarse sea salt. A squeeze of lemon is good, too. And who knew that writing about Brussels sprouts was such a traffic driver--I should come up with a Brussels sprouts enchilada recipe! A delightful combo! I'm a Brussel sprouts addict! I really like roasted Brussels sprouts and in fact I have some ready to be cooked right now. I also have some Bosc pears, so I am ready to try your delightful combination. Pears?!?! Now this is something I've got to try! YES!!! Brussels sprouts are my favorite! This sounds like a great combination! Great idea to add the pear. It's always the "controversial" vegies that are the most fun to eat. sounds delectable. will try this combo next time we get brussel sprouts. maria-Let me know if he does! meghan-Really? That's terrific! I really liked the combo myself. heather-Yay! It's something new for you to try. val-That's what I want to hear. Thanks! julie-You might just be surprised. kalyn-It really adds a lovely sweetness. dana-Thank you so much. It's the shocking process that helps maintain their color. Give it a try some time to see what I mean. abby-Roasting is the way to go. simona-I hope you like it. bee-I'm happy to hear that. This looks like a great way to eat brussels sprouts whether you like them or not. I love the flavor and texture combination! I'm really trying to learn to love Brussels sprouts, but it's not easy. Sometimes it's the aroma that really gets to me; other times it's the gassy feeling I get when I eat them. But I keep trying, especially when I see wonderful recipes like this one. 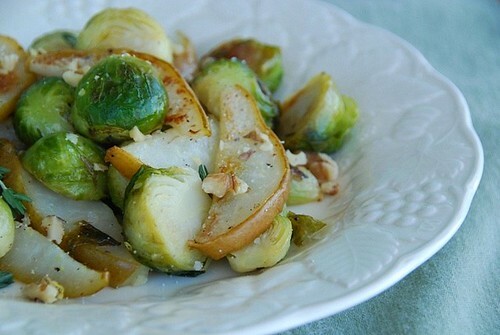 Another great way to enjoy brussels sprouts! I really like them, but my husband won't touch them...more for me, I guess! I like the addition of walnuts to this - I can just imagine how well the nutty flavor and crunchy texture work with the sprouts and pears. Nice! great idea! we've done it w/ some thin-shredded apples, but i like the pear b/c it's a bit more mild in flavor. i totally love sprouts, though, so there's not much you need to do to them to make me love them more! Can't believe that thanksgiving is on its way! Brussel sprouts is the ultimate veggy in my family, I can make this any day, it's too bad that my son having a hard time to appreciate it. Maybe I can give him your 5 tips for liking brussel sprouts. hi - you won a box of berger cookies! send me your address and i'll get 'em out to ya! What a lovely idea to make them with pears. We are not really fans of Brussels sprouts but must give them a second chance. Perfect timing!! I have a bag of brussels sprouts that have been staring me in the eye for a minute! In my father's case it's because Brussels Sprouts were the only veggie grown in England during the war and were served all the time. What a delicious recipe Susan! I must try it. I love bs anyway, but not the whole of my family, so I always try new ways :) Thank you for sharing this recipe. 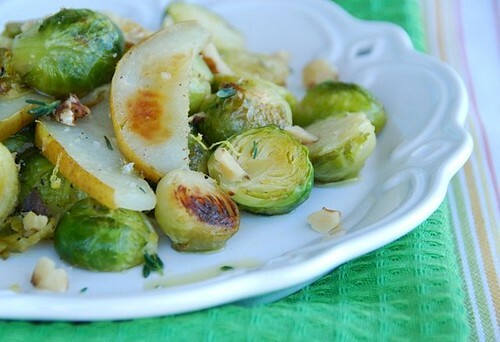 I happen to love Brussel Sprouts, but never would have thought to serve them with pears. Great idea! I love brussel sprouts - something I was actually ashamed of when I was younger, because no one I knew could stand them. The pear and ginger sound very interesting! This is definitely going to be on my table at Christmas this year! Thanks Susan. I couldn't agree more- roasting brings out the nutty sweetness. And I love your addition of pears. Inspired. (PS: Just added this link to a gluten-free Thanksgiving recipe list on my blog). Thanks, Susan! kathy-The walnuts really draw out the nutty flavor of the sprouts. wanf-I love them with apples too. ivy-The pears make them much better. tavolini-Don't you love when you have all the ingredients on hand? Thanks! lynda-I think kids feel obligated to say they hate brussels sprouts! Oooh my friend and I were just looking for new brussel sprout recipes and this one looks fabulous. And I do not cook with pears nearly enough! This is such an interesting combination.We are in the middle of summer, but I will keep this in mind! Great minds definitely do think alike, what with out posting Brussels sprouts in the same week :) And it's so true abouy the traffic - people are clearly desperate for recipes to reinvent poor, unloved sprouts! Love the addition of pears! 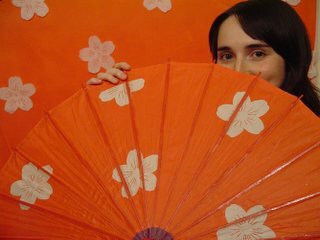 I just read your article (NPR news about the Kaki. I am originally from Brazil. We have two types of Kaki there, first is the soft Kaki and the second a hard Kaki similar to the ones I find here in the US. The soft Kaki is much sweeter and has a jello texture. The Kaki was brought to Brazil by the Japanese immigrants as well(1.5 million in Brazil) in 1908.
i wish i liked brussel sprouts. they are so pretty. can't blame my family either, since i was never served them (good or bad) as a kid. unfortunately, no matter how many times i try them, i still haven't developed a brussel-sprout-friendly-palate. this recipe looks good though: the pear's sweetness would balance the bitterness of the sprouts! worth another try. wanm-They are remarkable sweet when roasted. Hope you try them! fernando-Thank you for dropping by. I'm so happy you enjoyed my NPR piece. Apparently the Japanese have mastered the persimmon and people from all over the world are benefiting. This Roasted Brussels Sprouts and Pears is fabulous, my children loved it, i will cook Roasted Brussels Sprouts again and try the variations...how easy and quick it will to make? my veggie husband will love it and I'm sure it'll be a big hit with the foodies!! I didn't try this exact recipe, but my friend made roasted brussel spouts and pears last weekend - I'm pretty sure she basically baked a tray of brussel spouts with some cut-up pears - she might have squirted olive oil on them while they "roasted" but I'm not sure. Anyway, it was AMAZING. Most of this dish didn't make it to the table, it was so delicious, it started to disappear as soon as it came out of the oven. It was like eating candy! talk about an evergreen post! Love it and thanks for the brussel sprout inspiration!